Libraries have responded effectively to many changes over the years. Recently, changes related to new technologies and media have come to the forefront. As library users seek access to a greater variety of materials, as well as to computers and the Internet, the question arises as to whether these needs begin to supersede traditional library services like reference, circulation, and programming. However, data from a recent National Center for Education Statistics (NCES) report suggests a more optimistic fate for Colorado libraries, one in which new technologies and traditional library services co-exist and thrive. In fact, the report suggests a positive relationship between new media and technology and library use in general. 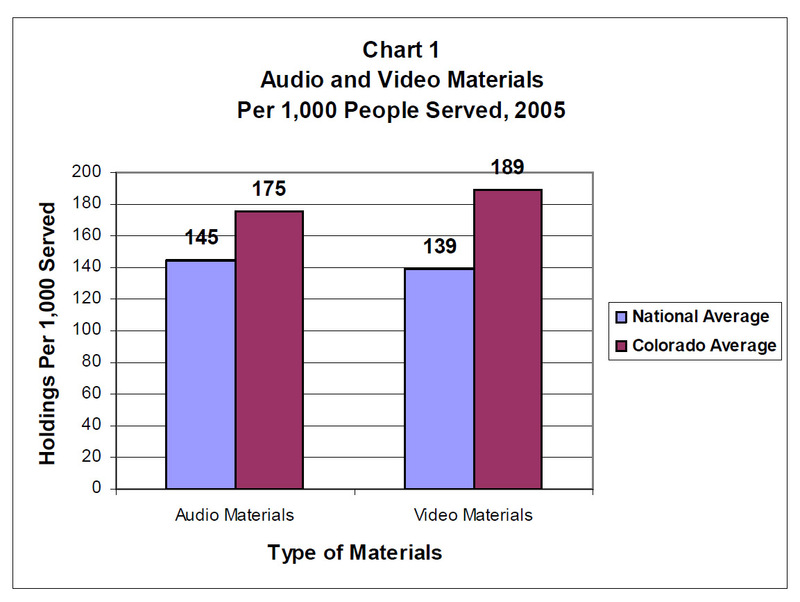 Released in November 2007, the 2005 NCES Public Libraries in the United States survey report shows that Colorado libraries have positively responded to changing information needs.1 For example, public libraries in Colorado collected audio-visual materials at a rate significantly higher than the national average; in 2005 they held 21 percent more audio materials per 1,000 people served, and 36 percent more video materials per 1,000 than the average U.S. library (see Chart 1). Colorado public libraries have also increased their commitment to alternative media without significantly sacrificing their obligation to print materials. Current print serial subscriptions in Colorado were 4 percent higher than the national average, while other print materials were lower by 9 percent. 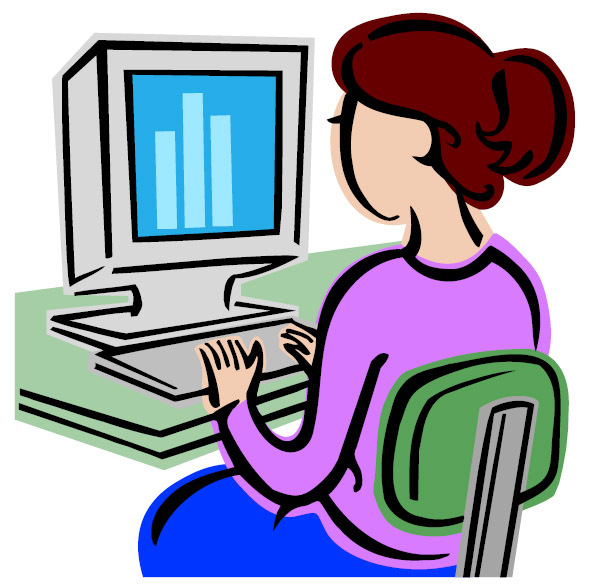 Similarly, in 2005 public libraries in Colorado also recognized the value of the Internet as a resource for public use. They provided 4 percent more Internet terminals per library than the national average. There is still room for growth, however. Colorado’s average is above the national average for number of Internet terminals per library, but the state ranks just 20th among the states on this statistic. Possibly because of this significant investment in technology and media, Colorado libraries have also maintained a very high level of traditional services. 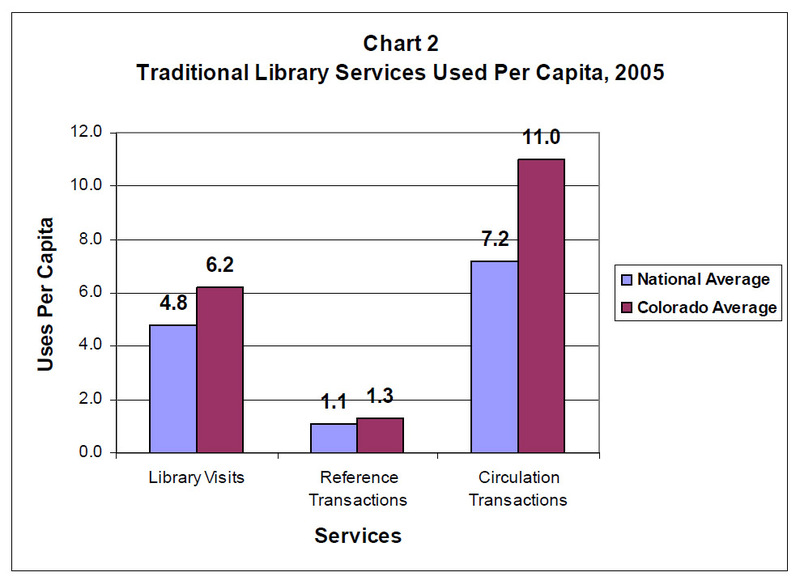 In 2005, the state was within the top 10 states for library visits, reference transactions, and circulation numbers per capita (see Chart 2). It was the state with the 6th highest number of circulation transactions, providing 53 percent more transactions per capita than the national average. The average number of library visits per capita in Colorado was 30 percent higher than the national average, while the average number of reference transactions per capita was 19 percent higher than the national average. Similarly, the average rate of attendance at children’s programs per library in Colorado greatly exceeded the national average rate of attendance. Colorado’s public libraries attracted an average of 4,929 attendees, or 49 percent, more attendees to their children’s programs than the average public library in the nation (at 3,301 attendees). Circulation of children’s materials in Colorado public libraries was also slightly higher than the national average at 36 percent of total circulation (versus 35%). While some may argue that investment in alternative media and Internet terminals indicates a shift in focus from children’s services to adult needs, these numbers support the idea that service to Colorado’s children has remained strong. For more information about the relationship between the Internet and other library services see: Access to Internet Goes Hand in Hand with Other Public Library Services and May Attract Library Visitors (Fast Facts No. 240, June 16, 2006). Compared to national averages, Colorado libraries are more effective at reaching out to their communities, as is reflected in the number of library visits, reference transactions, and circulating materials. The adoption of new media and technology does not necessarily mean a decrease in the use of public libraries’ traditional or familiar services. In fact, this shift appears to have inspired increased use, a fact that holds much promise during these days of steady change.